Gina is Flying Feet's resident expert for swimming. She has been involved in the sport of competitive swimming for over 35 years and has competed at the age group, high school and collegiate levels. At the conclusion of her swimming career, Gina began coaching swimmers. She has coached competitive swimmers at every level from age group and high school to the college level. 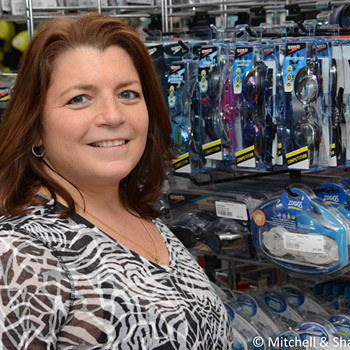 Gina's knowledge of competitive swimming helps her to outfit competitive swimmers and swim teams that visit our store for advice on the best gear. "I enjoy sharing my knowledge of swimming. It is rewarding to assist customers on their fitness or competitive journey." 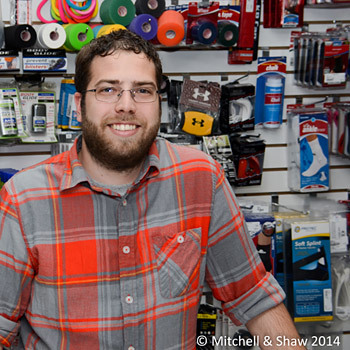 Corey joined the sales team at Flying Feet in 2005. A life-long runner, Corey started out on his Jr. High and High School track teams and continues to participate in races in the area. To date, Corey has completed several 5K races and a marathon. He has also played soccer since he was a child and still plays in adult soccer leagues. Corey also enjoys skiing, cycling, mountain biking and a variety of other recreational sports. Armed with his own experiences in a variety of sports, an understanding of body anatomy, and an extensive understanding of Flying Feet's product line, Corey is able to recommend the right footwear for our customers. He continues to learn from his own experiences and from other members of our staff. "I enjoy working for Flying Feet, as we truly care about our customers and are looking out for their best interests. We have a family atmosphere that makes working here enjoyable. I most enjoy helping customers and hearing about their successes, whether it's winning a race, winning a game or losing weight." 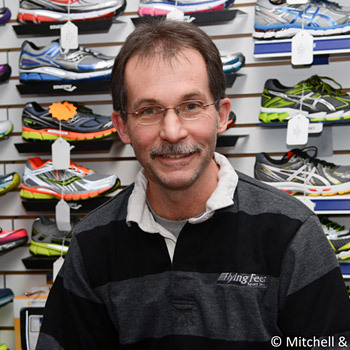 Dan has worked in the athletic footwear business for over 25 years, managing a full-line sporting goods store for 13 years before joining the staff at Flying Feet in 2000. He coached high school cross country from 1984-1986 and most recently coached Wellspan Health's 2013 Couch to 5k Program, in which 40 team members completed their first 5k (many have since gone on to complete longer races). Dan is a national-certified and state-licensed massage therapist who has operated his own practice for 16 years. His main focus is on sports and medical massage. Dan has worked in the medical tent during major marathons (three Boston Marathons, three Harrisburg Marathons, and seven Baltimore Marathons), treating runners for various muscular problems and cramping. He is a graduate of the Baltimore School of Massage Professional Training Program and the 100 Hour Medical Massage Program, and has returned as an instructor. Dan likes running, cycling, and some weight training. He has completed 15 road marathons and numerous trail ultras of various lengths. If you ask Dan, he prefers trail running to road running because it has less impact on your body. And when it comes to the trails, he believes "the longer and muddier, the better." Dan also enjoys following amateur-level sports, i.e. high school, college, and the Olympics. "I enjoy the personal interactions we have with the customers and the fact that the owners allow us to spend as much time as we need to with each customer. Working for Greg & Celine, and with the rest of the staff, is like working with your family. Greg will do whatever it takes to make the customer happy, and he really cares about and takes a personal interest in his employees. It makes it enjoyable to come to work. Laura's baked goods are another one of the benefits!!!" ©2019, Flying Feet Sports Shoes, All Rights Reserved.